Although it seems impossible to practice horse riding in the crowded cities around Barcelona, a few minutes away from the city you will find a place where it is a real pleasure to mount a horse. Wear your boots and put your pants on! Ride in a Natural Park and find a diverse mix of beautiful forest, green pine groves and impressive mountains. Discover these breathtaking Catalonian landscapes on horseback and enjoy a morning involved in Nature and horses. As well as enjoying your horseback excursion, you will have time to build a relationship with the horse allocated to you. We pride ourselves on giving guests time to get to know their horses, learning and enjoying how to communicate with them. This is the perfect experience for nature-lovers looking for an escape from the city. Minimum age for horse riding is 8 years old. However, we have ponies for the younger ones! Meeting point: The meeting point is at Plaça Ossa Menor (in the Glories Shopping center), which is easily accessed from the entrance located in Diagonal Avenue.We meet next to McDonalds. There’s no Living It office, it’s only the departure point. We can also pick you up at your accommodation place. Tell us when you check in! This tour has great success among our travellers. It has been awarded Top Rated Tour 2014 by Viator, our collaborator. 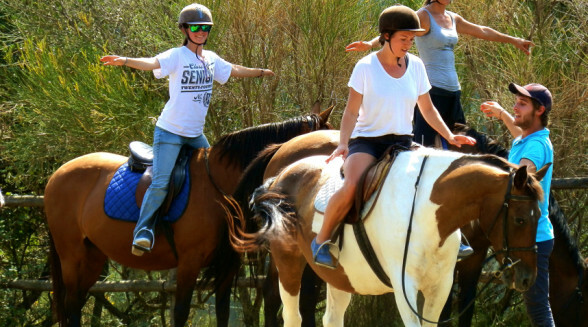 Again, the horseback riding tour has been awarded Top Rated Tour 2015 by Viator. 3rd consecutive year, the horseback riding has been awared Top Rated Tour 2016 by Viator. It was my pleasure to meet Barbara and team in the farm. It was amazing experience and I really enjoyed the farm and horse riding, specially the Arab horses were very calm and easy going. The guiding girl was very nice, helpful and experienced. I liked the traditional food that was offered. I would definitely do it again and again. Thanks a lot for making this happen and it made my day. De tocht, onderbegeleiding van Victor, was prachtig. Mijn dochter en ik hebben genoten van de paarden, uitleg en omgeving. Het was erg indrukwekkend. Mijn dochter was blij dat ze even de heuvel op mocht galopperen. The tour, guided by Victor, was beautiful. My daughter and I enjoyed the horses, explanation and environment. It was very impressive. My daughter was glad she could gallop up the hill. I was very impressed with the care taken towards the horses. They were happy, friendly, and well-fed. However, I was a bit underwhelmed by the tour, as I had quite hoped that the path through the hills might include some trotting. Obviously it would be unreasonable to expect a lot of trotting with a group of eight, but as I had been on a previous experience where we had learned to trot and canter with a similar sized group consisting also of beginners, I had hoped there would be a little bit, even just a minute or two, as I really wanted to show my friend what it was like. Joan (very sorry if I spelled his name wrong!!) was very nice from start to finish of picking us up and dropping us off. He was very engaging, and his fluent English allowed for interesting, very in-depth conversations about life in Barcelona! He was also kind enough to ask after the tour that I be allowed to do some trotting after he spotted that I wasn’t completely happy. The lady who toured us around seemed a bit sour at this as I was a beginner, but I was grateful that she helped me regardless, and she taught me well and insightfully about how to use the reins and how to trot properly. Getting to go at a little bit of speed on the horse definitely made me a lot happier! The food was also great, too, and I was happy that I got to try home-made tapas, and learn about the wine. My friend had a good time, and enjoyed himself. He was too vague for me to give any more feedback than that he would like to go horse riding again! Our van driver was very friendly, the ride was fun but I wish it had lasted a little longer, and the snack after the ride was delicious! Really nice way to spend a morning. Pick up could better organised perhaps setting hotel pick up times the day before the trip to minimise transport time. We had a mavelous day. Thanks you so much. Your colleague Marc is friendly and very professional-great with my two boys. Will definably recommend this trip. It was really nice. Both, nila and alex had made a good job. The horses have been in good condition. The food after riding was very interesting and delicious. Regards from Germany! Todo muy bien, Marc excelente, me quedo de enviar las fotos las estoy esperando, gracias! Everything was great, especially Jordi and Ana. Will leave a great review! They were great. The tour was great. I would highly recommend it! Puntual excelente atención, ideal para quien no ha tenido oportunidad de haber montado a caballo. For anyone looking for a neat way to experience Barcelona, the Catalan culture and the beautiful outdoors all in one, then this is a must! Everything was very relaxed and enjoyable from start to finish. The people were great; helpful, kind, and a pleasure to be around. Highly recommend. Thank you LivingIt Tours and everyone involved in the horseback riding experience! A superb trip in the hills outside of Barcelona. This was a such terrific excursion. Everyone at the stables was incredibly friendly and the environment was beautiful. The tour took us through woods and hills to a beautiful ridge that offered sites of the whole city. After returning through a picturesque town and another wooded stretch, we had a great lunch and some time to chat in the sun. We couldn’t recommend this highly enough. activity as well as see Barcelona from a beautiful vantage point. This was a such terrific excursion. Everyone at the stables was incredibly friendly and the environment was beautiful. The tour took us through woods and hills to a beautiful ridge that offered sites of the whole city. After returning through a picturesque town and another wooded stretch, we had a great lunch and some time to chat in the sun. We couldn’t recommend this highly enough. This tour was relaxing and enjoyable. I’ve never rode a horse but the pace was easy and very manageable. You’re picked up at the meeting point, then there is short drive to the stables up the mountains in Orria (am I saying it right?). Following that, you meet your horses and brush/clean them, and prepare the saddle. The guide is there to show and help you. You then get to practice some time riding the horses in a fenced area, and you learn how to maneuver your animal. Once that is over, you venture out into the nature park. Since it was winter, we didn’t get to see that many wild animals. The weather was really good and the scenery was pretty. There were quite a lot of slopes and for a moment I was a little worried my horse would have problems carrying me. Towards the end we had a nice surprise, which I won’t spoil it. But it was great. I was riding at the back of the group (horse #5), and couldn’t really hear a lot of the commentary, unfortunately. But nevertheless, it’s my first time riding a horse, and in Spain, and I checked that off my bucket list. Lovely ride around a trail on a mountain. Some parts of the terrain were steep. Great views and weather was nice. Bella gita, tutor simpatico e disponibile. Per il prezzo però il giro dura troppo poco. Peccato. Living it are providing something a bit different, and with enthusiasm. It was lovely to ride at a place which was much more than just putting you on the horses back and plodding off in a line. Carla is obviously expert and a very engaging person. The horses were lovely and in a full hour and a half ride took us to the top of the mountain for spectacular views. Some lovely tortilla, bread olive oil and wine were just right to relax with at the end. Barbara is a great host , more than a tour guide. Hospitality at it’s greatest. Our guide and our trainer, Carla, made us felt so welcomed. We learnt so much during the tour – from horse riding skills to the local culture. The highlight of the trip was at the peak of the hill where we saw the entire city and it literally took our breath away. The photos took on the trip by the tour was also well edited and sent within the same day – efficiency at it’s best. The lunch provided was truly authentic and mouthwatering. Overall, I would highly recommend this tour to people who loves nature, interest in horse riding, and who wants to experience the local culture. Living It has done to us what their name suggests. They allowed us to live in (and immense ourselves) in the local culture with top notch hospitality. Thank you, Living It, for the great unforgettable experience! I came to Barcelona for just 4 days. During that time I found the website of Living It. In that website you can find different kind of tours but I did the horseback Riding Tour. The experience was really friendly and amazing. All the staff really know the place and the horses. In my case my horse was really nice an quiet and that was perfect for me because it was the first that I rode a horse. The best part is when you arrive at the top of the hill the views of Barcelona are breathtaking, you have to see that view. 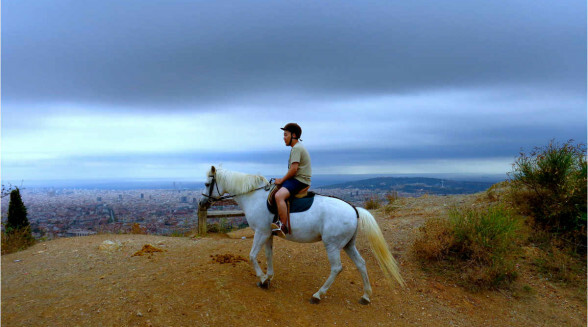 It’s a really amazing moment, because you are seeing Barcelona, at the same time that you are ridding a horse. I really recommend this tour and Living It. Thanks for such an amazing day and a wonderful experience. I went on the horse riding trip two weeks ago during a short break in Barcelona, and it was excellent. Easy to book, no need to print any details or tickets off, my email question was answered promptly. I was picked up from my hotel by Marc and it was a pleasant journey out to the ranch, and Marc was really knowledgable about the area. Once there, I was introduced to Alex who matched me with a suitable horse, the lovely Nevat, along with a riding hat (I’d brought my own riding boots and jodphurs, even in my hand luggage!). Once Alex had assessed my riding we soon set off into the national park. I really enjoyed trotting and walking Nevat, taking in the great views and learning more about the area and the horses from Alex. Once back, the horses were showered and settled, before I enjoyed a tapas lunch. There is a basic shower facility if needed, before the drive back. Altogether a fabulous experience. I’m really pleased I booked this, and saw part of the National Park in addition to visiting the city. The horseback riding experience was amazing; would definitely recommend to anyone! Had a lovely morning/early afternoon getting to know the horses and exploring the landscape. Fell in love my horse Rim and I wouldn’t hesitate a second to book another tour when visiting Barcelona again. 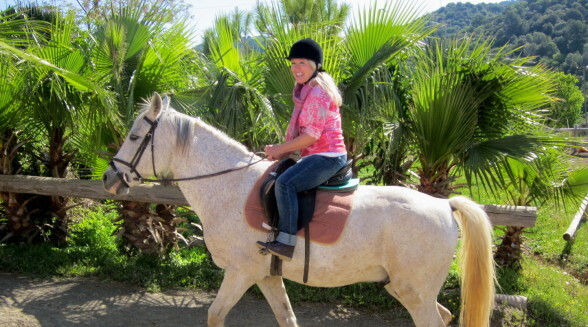 I booked a horseback riding with “living it and the experience was just amazing! Our guide, Noelle, was super cool and friendly. She explained a lot of things and we could feel her passion for her job. And icing on the cake… Laia! She was amazing with us and she even dropped us at the hotel. The horse riding was a birthday present for my friend and everything was efficiently arranged, even the “happy birthday song and mini cake” I asked at the last minute. I live in Barcelona and I’m very interested to book 2 spots for my girlfriend and I (as a birthday present for her). However, I am 195cm tall and 90kg.. is the extra weight a problem? I have a Level 3 horse riding qualification from France as I used to horse-ride back in the days. 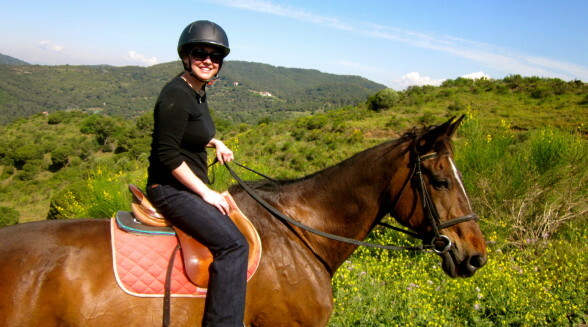 On a recent trip to Barcelona we booked a horseback riding excursion with LivingIt. Although we are experienced riders, the tour organizers were very diligent to match their horses with our riding expertise. The tour was on schedule from beginning to end, but always in a relaxed manner. Everyone was friendly and knowledgeable, and we had a beautiful ride. We now have some great pictures of our ride, that they took and emailed to us, as memories. We would definitely recommend this to anyone who would like to experience nature on horseback! Thank you LivingIt!! We enjoyed the riding! Alex did a great job at making us feel confident, especially as there was such a wide gap in riding experience between us. The horses looked very well cared for, which is not always the case. Troll was not shod and had a slightly swollen fetlock – but that did not seem to cause him any discomfort. Marc was very helpful. I think that he is really really enthusiastic and very kind. He was absolutely on time and also drove very carefully. I hope that this is helpful. We really enjoyed the day! I just wanted to write a quick email and let you know how wonderful our experience was today! Jordi was a great guide and told us so much about the city. Alex and the horses were amazing and the view was fantastic. The food Jordi provided us was very good as well. He went above and beyond our expectations. I will be writing a review online as well so everyone can know about this great experience! My girlfriend and I had a fantastic experience at the horse riding event in Sant Just on July 21st. I would like to thank you for the organisation. We had a really great day together with, Lai and the horses. I havent heard anything from Lai since though. She said she would mail me some Photos from the day. Hopefully you can help us. Hi Alex , we had such a good time on the horse riding . You were so patient with us . We are still laughing about it now . If possible we would love to see any photos you took as a momento of our day . Thanks again , esp for the birthday cake . We loved the experience! Our guide explained us everything related with the area, the ranch and the horses. We really enjoyed participainting in the horse preparation: brush our horses and saddle them up. We were a goup of 4 (2experienced riders and 2 begginers). The begginers had detailed explanation about the basics, which I think Alex did a very good job. We were a group of 2 experienced riders, and he addapted the tour also for us. We could trot and galop in the areana. We had a nice and relaxed riding in the Park. In total we rode 2hours! Completely nice and worthy experience for begginers and experts. Organizzazione perfetta. Menzione d’onore per Joan che ci ha coccolati e fatti sentire casa. Orari rispettati e tanta gentilezza e una cornice naturale molto bella. In meno di un’ora siamo arrivati ad un centro ippico di un piccolo paese che ci ha accolto con affetto e allegria. La passeggiata a cavallo é stata semplice, rilassante e divertente e ci ha offerto un’ora di piacere nel silenzio di una natura fiorita. We do horse riding tours every country we visit. We have never done a tour like this one before. We like horses, so we enjoyed taking them from the stables, brushing, putting the saddle… This tour is not only about riding, but also about getting to know your horse. 🙂 We rode 30min in the arena and 1,5h in the Park. Total 2hours!! The tour finishes with a nice lunch of tortilla, Catalonia bread, chorizo, wine and strawberries. We will be back in Barcelona next year, and we will ride with you again! I booked a private horseback ride while in Barcelona. There was a little problem with the pickup from my hotel, simply because of a metro strike and excessive traffic. Once at the hípica, I met with my guide Alex. He introduced me to my mount Doris and asked if I would like to clean out her feet in preparation for the ride. Once mounted, he assessed my skill level in the arena for a few minutes then we went out on the trail. Alex and I chatted about horses and our history of riding. When we came to a straight area, he asked if I was ready to gallop. Doris kicked it into high gear and was racing Alex’s horse! We galloped a few times during the ride, but mostly walked which was nice because I was able to take pictures of the scenery. When we returned to the barn, we untacked the mares and gave them a shower. Afterwards, we had a nice light tapas lunch with another group that was riding that day. This was one of the highlights of my trip to Barcelona, and I highly recommend the private ride if you can afford it. Seguimos en contacto y muchísimas gracias de nuevo por la experiencia que compartisteis con nosotros. It was amazing, the horses are very well trained and safe, it wasn’t boring or dull. They take good care of everything and everyone, with lunch and drinks down to saddles and girths. We get safety equipment and chest pads and I even got a surprise cake because it was my birthday!!!!!!! I really liked it and I would come again. This tour was amazing. Alex, our driver and guide, was very knowledgeable and great with people and horses! The stables and grounds were well cared for and the horses were beautiful! The trail ride gave us great views if the area and it was so nice to be on horses. Lunch served was also delicious. An excellent trip. Sia io che mio marito siamo stati benissimo..poi lui che va a cavallo è rimasto più che contento sia per il percorso che per i cavalli che ci hanno fatto montare…poi molto carino la presentazione e buono il cibo offerto alla fine del tour…molto cordiali e simpatici tutto lo staff. We went on the horse riding trip with Jordi yesterday and just wanted to say how much we enjoyed it. Jordi was so helpful and friendly! We had unfortunately not taken our purses with us so could not provide a thank you tip at the time”. My partner and I spend a week in Barcelona and we started off our holiday with the LIVING IT Horse riding tour. It was the best thing we could have done and we would gladly do this tour again. Alex our guide picked us up from a dedicated pick up point and drove us all he way to the ranch up in the mountains. The horses are well taken care of and well behaved, the views are breath taking and overall its an absolute MUST if you want to explore Barcelona’s countryside. The lunch prepared for us after the tour with local Tapas just made the whole experience complete and picture perfect. Thank you Alex for such an amazing day. We had a group of 6 people everything ran very smoothly we got picked up from an appointed location and rode up to the ranch where we begin preparing the horses for the ride. The ride itself was about 2 hours long so you definitely get plenty of ride time. I would recommend this tour for anyone who wants to try something different. Alexander, Thanks for sharing the link of the photos. We really had a great time riding and will definitely think to come back again and ride again. You have such a beautiful area for horses and we felt the love you give them. Die Pferde sind in einem guten Zustand und sehr zutraulich. Man merkt, dass gut mit ihnen umgegangen wird. Der Ausritt war trotz Wind und Regen ein tolles Erlebnis. Die Fotos haben wir innerhalb von 2 Tagen per Mail geschickt bekommen. Everyone had a positive experience. So much fun, wish it were longer. Thank you so much! It was a fun ride and a beautiful morning. We appreciated all of the information you provided as well. Take care! Had a fab time, Alex was a super instructor, we got to know the horses, brush them then after the fantastic ride through the countryside wash them when we got back. The horses are really well looked after. Horse riding in Barcelona was amazing. Neither of us had ever ridden a horse before and we were a little nervous. But we had an amazing instructor. She made sure we were both confident and knew the commands before taking us out. The ride was so much fun and a great experience. We also had a great time bonding with our horses before and after the ride. It was also great having Marc as our tour guide. He was happy to answer all of our questions about Barcelona and provided us with a great understanding of Catalan history. We also loved the traditional lunch that he prepared for us. We loved this tour. It was one of the highlights of our holiday. Alex, Thank you very much for sending the pictures and creating such wonderful memories of our Barcelona vacation. Elaine and I had a terrific time horseback riding and greatly appreciate everything you did for us throughout the day. Take care, be well and let us know if you ever plan on visiting New York. Very nice tour. Well organised. Marc from living it was so nice and took good care of us. Marina who led the riding was also very simpathic. The riding itself was great, very nice scenery with well trained horses. At the end Marc prepared for us some delicious tapas with good wine!!! Thank you so much for the lovely photos of our horseback riding experience! They turned out great! If you are looking for an excursion which isn’t the usual touristy thing this is the one. Really enjoyed the ride and Alex the tour guide was fantastic. The horses are very well looked after and it is great to see a different side of Catalonia. Thank you for the experience last Tuesday – both myself and my wife enjoyed it very much. Thanks Alex. Me and Ryan really enjoyed the trip. I’ve been telling everyone here about it so hopefully they go if they visit Barcelona. The tour guides were very friendly, helpful and knowledgeable and the ride was great from beginners to advanced. Our daughter is an advanced rider, and felt that the horses were very well cared for and the ranch and trail rides were wonderful. Great experience, good instructors and good food. I would recommend this to anyone. Monster is not as scary as his name suggests which was lucky as I had never been on a horse before but enjoyed the ride immensely! Thanks – hope to come back one day! Excellent , wonderful guides , beautiful scenery , delightful well schooled horses and ponies . Would definately recommend . Alex und auch unsere Reitlehrerin waren super freundlich, mit den Pferden wird sehr liebevoll umgegangen. Mein Pferd Doris war 25 Jahre alt, bestens ausgebildet und vorallem TOP fit – sie hatte richtig Spaß am Ausritt. Nicht-Reitern wird vor dem Ausritt das nötigste vermittelt, Reiter dürfen auch mal einen kleinen Galopp zeigen. Der Natrionalpark, durch den es auf dem Pferderücken geht, ist wunderschön und am Ende mit Pferd auf dem Berg zu stehen und unter sich Barcelona und das Meer zu sehen ist ein Ausblick den ich so schnell nicht vergessen werde. Auch die Tapas nach dem reitren waren sehr lecker. Insgesamt ABSOLUT weiter zu empfehlen!!!!! Und das Geld auf jeden Fall Wert! Excellent experience and well-priced. Note that payment is cash only and you will need to bring your passport if you are a foreign tourist. I went with two other friends, one who had no prior experience with horses and one who had intermediate riding experience. Communication was good as instructors and staff spoke English and were very friendly. 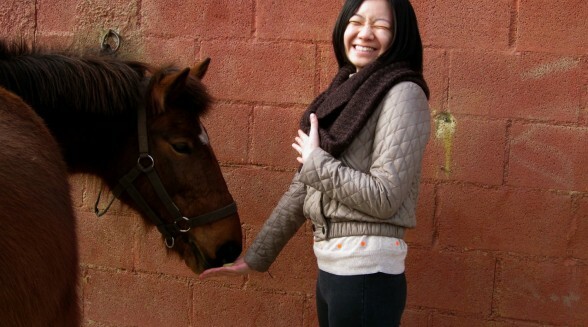 From an easily accessible departure point in the city, we were driven to a horse farm out in the countryside. The instructor, Alex, was able to tailor to each of our different riding experiences. We learned how to steer the horse and to trot. My horse was named Monster and he was a very well-mannered fella. Nobody had problems with the horses’ temperaments. After some time in the horse pen, we embarked on a mountain trail where we saw the entire of Barcelona at the apex. The tour concluded with a tapas lunch of Spanish omelette, bread, tomatoes, and red wine. It was a very filling meal for the three of us. They even took pictures for us throughout with their camera and sent them to us via email, which was great as I would not recommend bringing any cameras or backpacks for horseback riding. Absolut Empfehlenswert und ich würde diese Tour gerne wiederholen. I had an amazing time and next year when we come we will be doing more tours with yourself. I cannot recommend Living It highly enough. My girlfriend and I just had the horse tour yesterday. I just wanted to say that the trip was amazing and the view of barcelona was outstanding. We loved it and we’re definitely recommending it to friends. Thank you and have an amazing eastermonday! We truly enjoyed the trip! it was amazing ! Thank you so much for your email I’ve had a look at the pictures from the link and they look great! My husband and I stayed in Barcelona and took a Horse back trail riding tour through living it.com with a wonderful guide Alex Dom who picked us up from our hotel and guided us all the way…Everything was absolutely wonderful the best trail ride we have been on..The place and people were absolutely magnificent and prices were more than fair…I highly recommend this tour for the entire family…. We had such a great time on this trip and the horse back riding was a big reason for that. The guide, trainer, and others at the venue were all very friendly and helpful! The views were incredible and horses wonderful. I would go back any day. Strongly recommend for anyone! I thoroughly enjoyed the horse riding experience! I have told friends about it. Just emailing in regards to the photos Nuria kindly took. I took the horse-riding tour during my recent stay in Barcelona. I met the guide at a central point in Barcelona – the guide spoke perfect English and told us lots of interesting facts about Barcelona on the journey to the stables. At the stables we helped get the horses ready and then had a short lesson in the paddock before venturing out. The horses were very calm, good natured and immaculately kept – the stables seemed very professionally run and the guide who took us out on the horses was friendly, knowledgeable about the national park and spoke French, Spanish and English fluently. We walked up the mountainside to a view point overlooking Barcelona and as it was a fine day we had a wonderful view of the city. Then back to the stables to help cool the horses down with a shower and give them a feed. We then had a light lunch before heading back to the city. I think this trip would suit people with little or no horse-riding experience – I am far from expert but I would have liked the option of a longer trip or some trotting but I did enjoy it and it was great to be out in the countryside. Thank you Alex, I Love the Pictures and the editing!!! They have brouhgt very nice memories to me. Thank you so much for the lovely pictures, we really enjoyed the riding experience!! After a few days of looking at rocks and history with five daughters, this was a pleasant diversion that we will all remember. Professional, courteous staff ( not always the norm when you are a tourist ) made this a one of kind experience. As wonderful as the lesson and ride was, the light lunch was delightful. Thank you Alex and Carla. You made our visit to Barcelona very memorable! I would be interested in doing the other Living It Tours next time! They look different and interesting! My husband Morgan and I shared an incredible, unforgettable experience riding with LivingIt last thursday. Everything – from the pick up in Barcelona, and the drive out with Alex, to Carla’s expert guidance and leadership during the ride, our gentle and yet spirited horses Doris and Romy, the welcoming and hospitable atmosphere of the stables, seeing the pastured and stabled horses in such good spirits, meeting a new friend from Paris, the stunning views of Barcelona and the coast from Mount Tibidabo, the wonderful weather, and the refreshing luncheon al fresco – all were thoughtfully planned and beautifully executed. Muchas gracias and hats off to all for making that day yet another rewarding and uplifting part of our honeymoon in Spain. We’d enthusiastically recommend LivingIt to anyone who wants to connect with nature and animals only a short drive from downtown Barcelona!! All our best wishes, and we hope to see you again for an upcoming anniversary trip. The pictures on Facebook are great! Thank you for a great experience and we will definitely see you again in Barcelona. Thank you for the pictures, they’re great. Thank you once again for the wonderful time. Hope to see you again really soon. Alex was an awesome guide and made us an afternoon lunch which was unexpected. Tour took us to some great views of the entire city. Overall best value in Barcelona!!!! Thanks for at great trip! We had a great time, just a small group of four which meant we could chat and move without bumping into each other and enjoy the landscape. The horses were gentle and only needed a little prodding 🙂 Thank you very much to our guide and Ellie for leading us though our paces before and during the trek. We had an absolutely amazing experience in the beautiful nature of Spain. Alex (from living-it) came and fetched us, helped with the horses and drove us back – He really treated us well! All the way through we felt taken care of, and it was so much fun riding the horses and seeing the beautiful view at once. We really enjoyed a break from the city, with the nature and a perfect ending with a nice meal! When we came home we could enjoy all the pictures Alex send to us – really good quality. We would definitely recommend it to others! Alexander, I really appreciate your help! Fantastic horse back riding experience both for beginners and the advance riders. My 12 years old had been learning to ride in HK for a year. This experience of up hill trotting was fun with the instructor. The tour guide Joan was excellent setting up table with wine and some good Spanish food. Overall is a real good experience and enjoyable tour. Fantastic! Well run and our guide Carla was excellent. She was patient and explained us everything before going to the forest. It is obvious that she loves horses! The horses were beautiful! I absolutely recommend this activity! For me it was a great break from the city. Alex was a great guide and the whole riding tour as well as a Catalonian lunch experience was simply magnificent! Very professional and as advised in a brochure is off a beaten track. Thank you very much for this experience! Many thanks for making our time so special! It was just perfect!! Thanks for the pics, they look great! This trip had its hiccups, but all in all, it was very, very adventurous!! I’d definetely go on it again, and recommend it to a friend. The tour guide, Carla, was very helpful, and fun. The lunch they serve at the end of the ride was tasty and satisfying. Many thanks for sending the link through. It was a terrific day and great to have captured the experience in the photos. Fantastic tour. Picked up in the city by Barbara where she took us up to the park. Then we were introduced to Carla and learned about the different horses they have at the center. We had a trot in the arena to make sure we had the basics down then went on a long trail around the area. Great fun! Very friendly and helpful tour operators. Thanks so much Barbara and Carla and hope to see you again.I have to mention though pick up and drop off were not included, as the excursion took longer, Barbara called my next excursion’s operator and Joan drop me off in front of the tour agency of the next excursion. Although the sense of competition of the next excursion’s tour operator didn’t let them to be as helpful as this excursion and didn’t wait for me for less than 5 minutes, but I was really impressed by the sense of responsibility of this excursion’s operator. Highly recommended. Wonderful, fun and awesome day of riding in Barcelona! Barbara, who picked me up in the city center, and Carla, who I rode with, were both terrific–friendly, professional, energetic and accommodating. Couldn’t imagine a better time–a great horse, stunning setting and delicious Catalon lunch. Plus, Barbara and Carla took pictures and shared them with me the same day, which was much appreciated. Highly recommend! I really appreciate the photos. I am going to download them as soon as I can. My experience was very relaxing and enjoyable. I wanted more time and more freedom with the horses eg gallop. The trainer was nice and clear in her instructions and very uplifting and wanting to make sure everyone is doing great. Thank you … we were wondering about the photos as well. I met my guide at the given date and place. She really wanted to make everything so that the members of the group felt themselves well and enjoyed the experience. The ranch was not far from the city-center in a natural park. The horses were already prepared and we received the safety informations and the helmets as well. The horses were well behaved and amenable, even for beginners, the guide was attentive. We had the best view of the city Barcelona and even received a taste of catalan foods. Thank you very much for pictures. I have downloaded them straightaway after you sent me a link. When I will visit Barcelona I will definitely check other tours you have. The ride was great and pictures great too. Carla was a terrific guide. My horse was a good trail horse but my sons horse kept constantly tossing his head. The stables were full of beautiful horses. Beautiful vista. My only problem was the up and down terrain and dogs on the loose. Carla did a great job making sure all riders felt confident riding. I had only ridden English once but got accustomed quickly. Alex was a very pleasant tour guide and provided a very nice brunch after the ride. Fun day. Great diversion from the city. Carla pointed out almond trees and other vegetation. Enjoyed our ride! Very nice experience. The crew at the equestrian club were very friendly and professional. The ride was absolutely great. We had breath taking views of all Barcelona. Thank you so much for the wonderful experience. The pictures are really nice! Every single one of them. We will definitely sign up for more tours if time permits, or when we are back next time in Barcelona! Once again, thank you! Thank you very much for the photos. Very nice ones. Please send Núria my regards and it was a wonderful trip. Thank you for everything. See you soon. All the best for you all! Lovely guide. Horses were ok, a little scrappy but it was the end of winter. Equipment would not have passed a gear check for an Australian Pony Club. Spectacular views and a pretty ride through the hills. Lovely simple lunch at the end. Worth doing. Thank you so much, cool pictures. We had a great trip – thank you so much for the experience! just perfect, and really nice guides :-). Nachdem ich am Treffpunkt von einer sehr netten Betreuerin abgeholt wurde, ging es auch schon direkt in das nahegelegene Naturschutzgebiet, wo wir nach kurzer Einweisung auch schon losritten. Die Reitlehrerin war sehr nett und mein Pferd öußerst brav. Nach der Tour gab es noch landesübliche Tapas und Wein. Eine sehr schöne, aber auch ziemlich teure Tour. Trotzdem zu empfehlen. 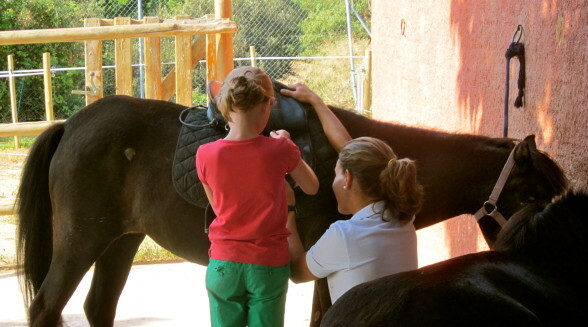 Living It’s horseback riding experience was far and away our favourite activity in the week we spent in Barcelona. It’s clear that they work closely with the horse riding school, as the whole process from arrival to our excursion was seamless. Both Núria from Living It and our guide were tremendous. Our guide was knowledgeable, friendly, and made the whole process relaxing. When we got there, we were immediately walked around the school, told more about what they do, and got to see the dozens of horses they have on site. Our guide seemed to know details about every horse at the facility, their temperament, and personality. It seemed like they rescued horses as well, which we were really happy to support a company of this nature. Our guide made a special effort to show us traditional Spanish horses and explain the differences between the horses we are used to in the States. I’m not sure if its always this way, but our trip was only me, my wife, and the guide. This made for a personal experience as we were given the attention necessary to make sure we were comfortable with the horse, how to make the necessary commands, and pictures were taken for us. Living It, with the help of the guide, sent us nearly 100 pictures of our day at the horse park. This was amazing, because we could just worry about having fun and not recording the events of the day. The actual ride was beautiful and easy through many trails up to the top of a mountain overlooking the city. It was relaxing, easy ride with the horses very well behaved, but still had a lot of personality. I would have certainly been comfortable with Children on the horses. When we got back, we got to feed the horses a treat and there was lunch prepared for us. To remember our time, we received certificates acknowledging our excellent horse riding, which was a really funny way to end the trip. It was a very good trip with the horses, The arrangement from our guide Vicky was super. I like the horseriding and if I can I will come back. Thank you so much for perfect foto and absolutely unforgettable day! The staff was really attentive and answered all of our questions swiftly and with confidence. They clearly know their business. The horses were a pleasure to ride, very cooperative and obviously well looked after. After the ride we were treated to some really delicious tapas and Spanish omelettes. 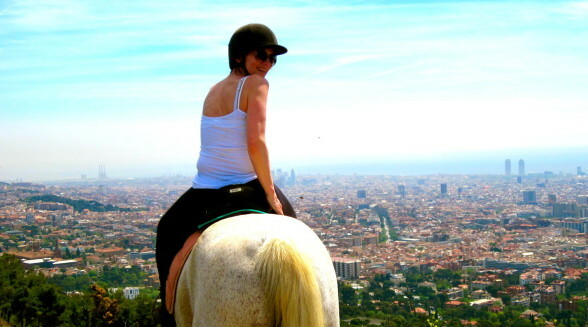 This is definitely a must do horse riding experience when visiting Barcelona. I just loved it. It’s a riding experience plus! I went to the meeting point in Barcelona central to be picked up by car to go to the riding school but some people were collected at their hotel. On arrival you get to see around the property and the horses who live there before you meet the horse you are going to ride. All the horses are well looked after and in good condition. You can brush your horse and saddle up. Then you go down to ride in the arena to get familiar with your horse and have your riding assessed to ensure you match your horse. You are briefed on your horse’s character and background and given options for what riding you would like to do. We all chose to make the most of the trail ride. The ride through the natural park is great, with fantastic views of Barcelona city and beyond. All the riders in our group were experienced so we walked, trotted and cantered. The horses are great to ride. Carla was a fantastic and informative guide. Barbara, our driver, was fantastic as well. It is hospitality plus! The authentic lunch at the end of the ride was so amazing. I had an incredible time and would recommend it to all. It’s an experience that will be hard to beat! The pictures are brilliant! We very rarely take cameras with us, as we want to “live in the moment” rather than through a lens so it is especially nice to have these very candid shots that will remind us of our experience. The smile on my face surely shows how much we enjoyed the day. You can absolutely use our pictures for your website and publicity material. I will write a review and post this on-line as I would highly recommend this activity to any riders out there. Thanks for following up with the pictures, really lovely. We had a fabulous time and really appreciated your friendliness! Thank you so much for the pictures as well as the wonderful experience! We had a great day! Thanks again! I had a fantastic time, the weather was beautiful, view from the mountain was amazing and it was a really enjoyable ride with Clara. Barbara and Ruth were both very hospitable! Many thanks for the pictures , they are excellent! Thanks again for a great day out. I’m sure we will do it again on our next trip to Barcelona. Sandra D. & Paul P.
It was one of the best tours I did in BCN, and again big thanks to you! Thank you for the experience. I really liked the visit at your riding school and was satisfied with Doris as well :-). I wish you the very best and hope to be able to visit you again. Had a great experience riding! Thanks so much!! I just received my photos from you via dropbox. I just wanted to say that my day out with you was excellent! I am so very happy with the experience! And everyone was so lovely and friendly! Thank you so so much!! I’m recommending this to everyone! I will be back! Thank you for the photos, we are finally home from our trip! We enjoyed our horse riding experience and will make sure to write some favourable comments on the Trip Advisor site! Thank you very much for the lovely pictures, we will copy them when we get back into HK in a few days time. We are still on our trip in Mallorca. We had a fantastic experience with your tour and Joan is a very good guide. Thank you. I would like to really thank you for all your effort and support. It was a very nice experience and a welcoming one. A big thanks from the heart. 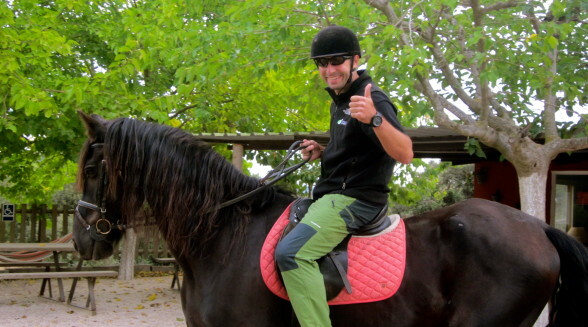 Wanted to thank especially Juan, Barbara and Carla for the amazing horseback riding last Friday. Could you please share the photos as Juan promised to do yesterday. Very impatiently looking forward to seeing the photos. Once again thank you for the activity and hope to see you again. Our personal guide was delightful. Due to the heat of the day and how it affected me, I was unable to partake of the riding tour. My grandson was treated royally. He learned the history of the Spanish horse he was to ride, took part in preparing for the experience by grooming the horse and fitting saddle to horse. The instructor prepared him by training in the “ring”. Then the two of them went on the riding tour. He was tired and hungry when the two returned to the stable area where the option of cooling down the horse was available. My grandson was hungry so he skipped that. Then we were treated to a delightful light lunch by the guide from “Living It”. The pictures the guide and the instructor took were edited and sent directly to my daughter in Utah. I understand few people take advantage of this opportunity. More should. The personal attention and instruction are amazing. The location is awesome. We learned a lot about the riding school as well. I had a great time riding in the beautiful fragrant Park with Carla as our expert and cheerful guide and Jordi who had never ridden before but manged to do a lot of trotting – impressive! A nice ride and a great way to see the countryside and nice fo have so much contact with the horses. Barbara’s organisation and food were relaxed, efficient and tasty! Thanks so much for all the information and for the lovely photos, and, yes of course you can use any of the photos if you want. We really enjoyed ourselves and will definitely be recommending you to friends. 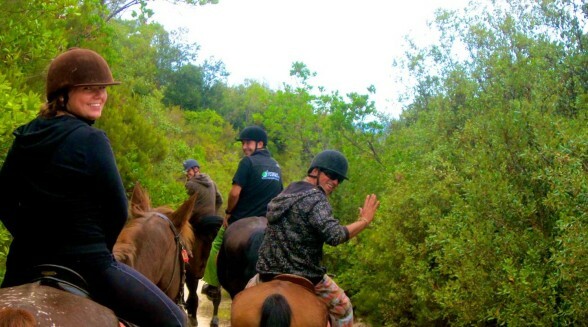 Thank you so much for the pictures of Ben enjoying his horseback riding experience! He has not yet returned home from his trip to Barcelona with his grandmother, Sheila, but I am so excited to hear all about it. He was so looking forward to seeing your beautiful city. You may certainly utilize the photos for your website and facebook page. Have a wonderful day and thank you for creating some wonderful memories for my son! Another fantastic tour. The pick up was punctual and then we were introduced to the area we were going to. Upon arrival we were given a tour of the stable and then rode through the beautiful park coming to an awesome lookout over Barcelona. After the ride we were served a beautiful lunch on the terrace. What was amazing at this stable is they let you groom the horse and saddle him and we got to cool down the horses and brush them after the ride. We love horses so we just loved the experience. The two guides helped us get online tickets for Sagrada Familial and then drove us directly there. Service like this is fantastic. We were very impressed. This was an awesome day – we got picked up from central Barcelona and driven out into the country. We got to brush the horses and saddle them up, had a quick lesson in the arena then off out up hills to the most amazing views of Barcelona. This is an experience not to be missed. Lovely gentle ride, lovely girls that took us, and when we got back a real Catalonian lunch, complete with red wine in the sun! Lots of fun. And so different from the usual touristy-tours. Had a fantastic time. Met by Barbara who took me on a leisurely drive into the Natural Park. I was the only booking that day and it was most rewarding for me. 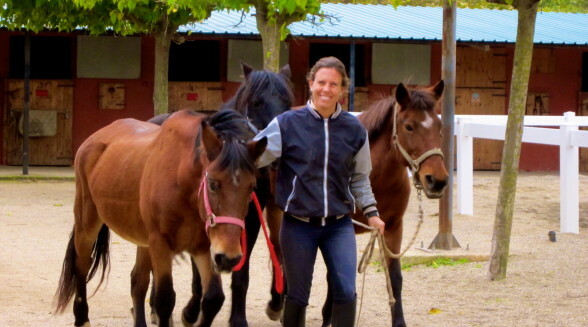 We arrived at the the riding school and stables and met with my riding guide, Clara. I was given a tour of the stables and an explanation of the activities they provide there. Then off to meet my horse, brushed, saddled and walked him to an arena for some lessons in riding skills. Then into the Natural Park for a pleasurable ride. Clara had wonderful knowledge of the types of trees growing and other vegetation. The ride also had amazing views over Barcelona. The ride itself is pleasant, fun and my horse was very well behaved. When arriving back at the stables, unsaddling of the horse, a treat for the horse and a hosing down to cool off, followed by a lovely Catalan style lunch. Thanks for a wonderful day. The booking and arrangement with Barbara to pick us up from the hotel was seamless. When we arrived at the equestrian center, our horses were ready for us. Our guide showed us how to brush and saddle up our horses. She then taught us the basics of horse riding in the arena before bringing us to the park. The ride to the lookout point of the park was wonderful. We had a fantastic view of the Barcelona city. On the way back, our guide even gave us a choice to go via the shorter or the longer route. She was very patient with us and was not in a rush to end the tour. The kids chose the longer route of course. At the end of the ride, we had a chance to reward our horses with some goodies. Barbara prepared a light lunch for us at the center, which was perfect right after the ride. We love the pictures that they took for us. I enjoyed so much! We learnt about Spanish horses and then went for a short ride in the arena. We did some practices there and finally we went for an amazing ride in the woods. Horses are so nice… I would do the tour again! Thank your for such a great morning! I enjoyed horse riding in Natural Park where is suburb of Barcelona! It was good place for trekking. My friend was first riding but she also had fun because we had lesson how to ride horses before starting trail. So anybody can enjoy this tour. Horses at the stable are very cute and funny:) I love them! A fantastic experience! From start to finish the day was great. First meeting the living it agent was easy, then travelling out into the mountains to meet the horses and staff was great. A bit of time getting to know the horse and saddling up before a very comprehensive lesson in the arena on how to “drive” the horse (essential for us as first timers), were all the ingredients needed to make the 1h30 tour around the beautiful scenery of the national park an absolute pleasure and fabulous day.The day was concluded with a little refreshment for the horse and traditional catalan fayre for the riders. Simply a great day that I will always remember. I cannot recommend this excursion more highly….the best day in a city that offers much competition for having a great day!!! Well done Barbara and team for the organistion and planning for this excursion. I had a day by self in Barcelona because my friend was working. I contacted LivingIt and I went horseback Riding in the beatiful Natural Park close to the city. It was an amazing day and I had so much fun. It was a perfect way to see the nature in Catalunya and I will definitely recommend the tour. It doesn’t matter if you are a kid or a grown up, this tour is for everybody. I will for sure contact LivingIt about a new tour next time I am in Barcelona! We contacted LIVING IT via email prior to our trip. Everything was efficiently arranged by email and Barbara, our guide, met us as planned at our hotel. Everything about the day was wonderful including the weather! It is a bit expensive for the average traveler, but I would say worth the money.